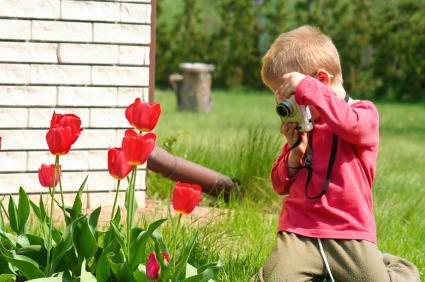 Choosing a digital camera for kids can be easy if you know what to look for. Special considerations need to be given for young photographers, depending upon their age group. If you're in the market for a children's camera, there are a variety of things to consider before making your purchase. Ready to take the plunge and buy your child his or her first camera? You should consider the age, maturity level, and level of photographical knowledge your child has before buying. This can help you decide whether or not you want to spend extra on the more expensive cameras. The following companies manufacture kid-friendly cameras for budding photographers. 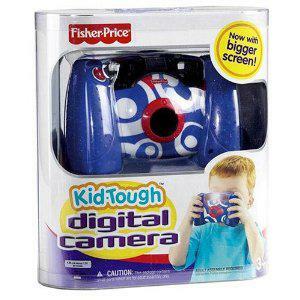 Fisher Price Kid Tough Camera - Choose from a pink or blue version. This waterproof camera can be taken just about anywhere your child desires. The camera can be submerged in three feet of water for up to 30 minutes. It runs on four AAA batteries and has a built-in 64MB of memory. PaulsTravelPictures.com has given the camera a very positive review, noting that the picture quality is good for a toy that is built for such young children. It is compatible with both Windows and Mac and uses a USB port to transfer photos. Vivitar ViviCam 7022 - There is nothing special about the ViviCam other than its price point and its shutter speed. High shutter speeds are very important on cameras for children because they often have a hard time keeping the camera still while taking a picture. Review site TestFreaks.com has a number of reviews on the product, most of which state that the camera has a definite tradeoff between picture quality and cost. However, the cost of this camera is really what makes it a great camera for small kids. It has an LCD view screen for viewing pictures, expandable memory via SD slot, and it is cheap enough to not miss if it gets dropped in the river by clumsy hands on your next outing. 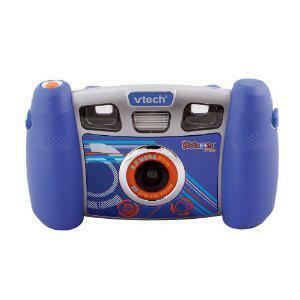 V-Tech Kidizoom Light - V-Tech is well-known as a top-level provider of educational electronics for kids. The Kidizoom Light is the little brother of the Kidizoom, and provides most of the same features as the full Kidizoom, with a lower resolution. This camera is designed for very young children around the age of three. The screen is clear enough so children can frame their shots. It features a strong, rubberized frame that is built to withstand punishment. V-Tech Kidizoom - The Kidizoom is the more advanced version of the Kidizoom Light. It is tougher, built with a better camera, and comes equipped with a large variety of fun stamps that kids can edit onto their photos right with the camera. PCMag.com notes that the Kidizoom also comes loaded with five entertaining games and has the ability to create digital video as well as stills. Canon PowerShot D20 - This is, by far, the most advanced camera on this list. It is going to be two to three times as expensive as other cameras for kids, but comes with a host of features that are great for young photographers. The LCD screen has great resolution, there are many different scene styles to choose from, and it takes substantially better photos. It is also built to be shockproof, waterproof, dustproof, and freeze proof according to TechRadar.com. This camera is a step up from the others and a bridge into more advanced photography. It is best suited for children that have had other cameras in the past, and who show more than just a passing interest in photography. The best advice for anyone thinking about buying a child's digital camera is to read the reviews from other people who have bought the cameras. There are a few great places to find reviews on kid-centric cameras. The kid's camera list at ParentsConnect.com is full of different cameras and lists their pros and cons. The photography shootout at AlphaMom.com goes into detail on four other cameras as well. High grade plastic - This will help protect the camera if it is dropped, bumped or kicked. Rubber hand grips or handles - These are helpful, especially for the youngest photographers. They provide a secure grip even under water. Hand strap - Loop this around a child's wrist to assist in hanging onto the camera. Quality lens - The rest of the camera may be plastic, but a glass lens is easier to clean and less likely to get scratched. If you are worried about the lens breaking with very small children, simply opt for a camera with a plastic lens instead. Memory card - Children will take many photos in rapid succession, often dozens at a time. To avoid having to stop the fun during a photo shoot, opt for memory cards with lots of room and carry a spare just in case. USB port - Standard with most digital cameras. This makes it easy to upload and edit photos to any laptop or desktop PC. LCD screen - Allows children to see the picture before and after they have taken one. It also makes it easy to delete unwanted photos. When it comes to buying electronics for children, there are a few things you should always keep in mind. Kids can be prone to spills and accidents, so it's important to search for something that will provide them with the opportunity to be creative, but is also rugged enough to withstand your child's enthusiasm. Finding something inexpensive that is built tough and provides passable images is really all small children need.